How many years have you been training in dog agility? Thor - he smiles when doing agility! What do you love most about dog agility? What got you into dog agility in the first place? Having a Weimaraner - they need a lot of brain work as well as physical. It really made a difference to his overall behaviour and our bond became much stronger. Get ready to get HOOKED! Always feel free to approach club members - we love encouraging new people to our club and the sport! Tank – 3 year old Border Collie x Huntaway. Tank is my first agility dog, and is often mistaken at shows for a pony. He is regularly commented on due to his size, and his unique feature of one ear up and one ear down. Camo – nearly 2 year old Border Collie. Camo is supposed to be for my husband to run, but I may yet steal him back as my own! He is another unique looking dog, and not to be left out decided to grow almost as big as Tank. It has been suggested that perhaps I shouldn’t have fed him whatever I fed Tank…….I am getting a reputation for growing big dogs. 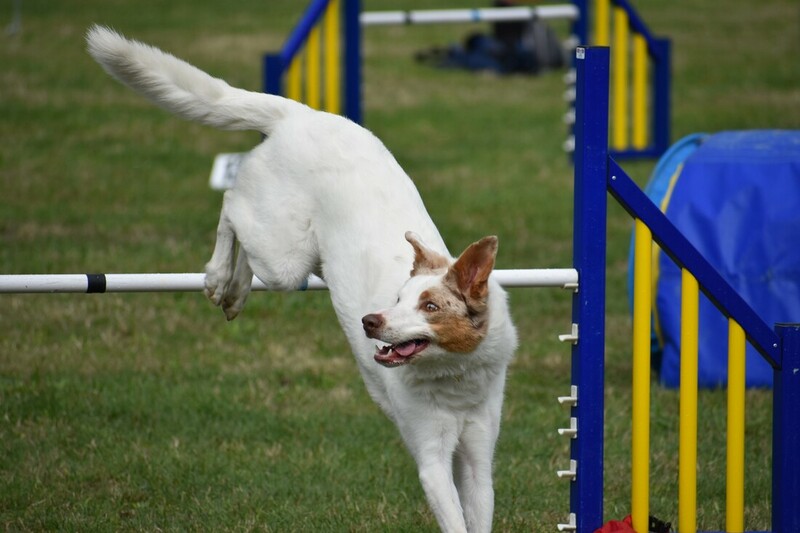 I competed with Tank at our first Agility Nationals in 2018. 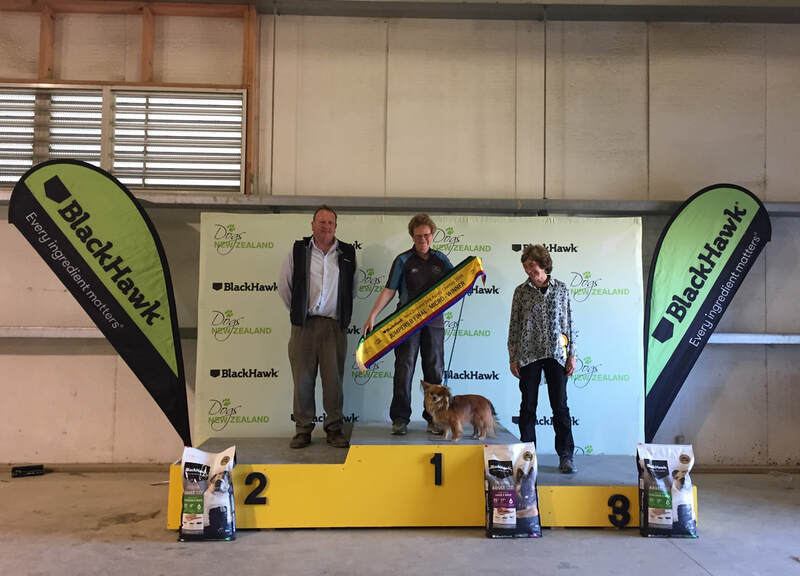 He performed exceptionally for me in a tough environment (noise and number of people and dogs) – doing well enough in his runs to make the Jumpers C finals (one of 21 dogs, and one of 6 maxis), and going clear in the finals. This was a massive achievement for our first nationals. I was so nervous going into the finals, knowing everyone stops to watch, but was well supported by other seasoned club members who walked the course with me and reassured me we could do it. It was a terrifying but very exciting experience. Spending time with my dogs doing things they love, learning new things myself, and making great friends who are just as passionate about agility and dogs as I am. 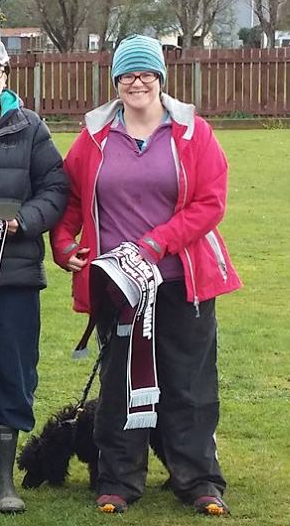 I also enjoy helping others getting started on their agility journeys, hoping they catch the agility bug like I do. I remember being young and watching TUX wonder dogs, and thinking that was what I wanted to be able to train a dog to do. I bought a puppy with no agility knowledge myself at the time, but knowing that was what I wanted to do, and taking a guess that as a working breed mix he would okay. I was very fortunate that he loves it just as much as I do! Do you train in any other dog sports? I am officially a dog sport addict! I am also keen to do scent work in the future, and more trick training. Don’t give up. The perseverance when things aren’t going so well pays off. It would be hard to see it now, but when Tank started he was more interested in running off and saying hi to other dogs and people halfway around the course, including in the middle of a round at champs shows. Huck - he's a black Kelpie who comes from a line of working farm dogs, and Fei - she's our new pup, also a Kelpie but brown, unsure of her history as she is a re home but have been told she also comes from a line of working farm dogs. My first clear round with Huck at our ribbon trail (he normally runs for Frazer my partner so I don't compete with him a lot). Huck is a Kelpie, you cannot physically tire these breeds, they need mental stimulation. He loves to learn. It's a great way of keeping him out of trouble. We train Flygility with Huck as well, it's a form of Agility, but involves the dog navigating a course without you by their side, hitting a box, catching a tennis ball, and bringing it back to you through the course, all while racing a dog in the ring next to you (as oppose to racing on time which is how agility works). Huck really loves Flygility, he loves the thrill of racing against another dog. There are so many methods to training your dog, ask for advice on various methods and see what works best for you and your pooch. 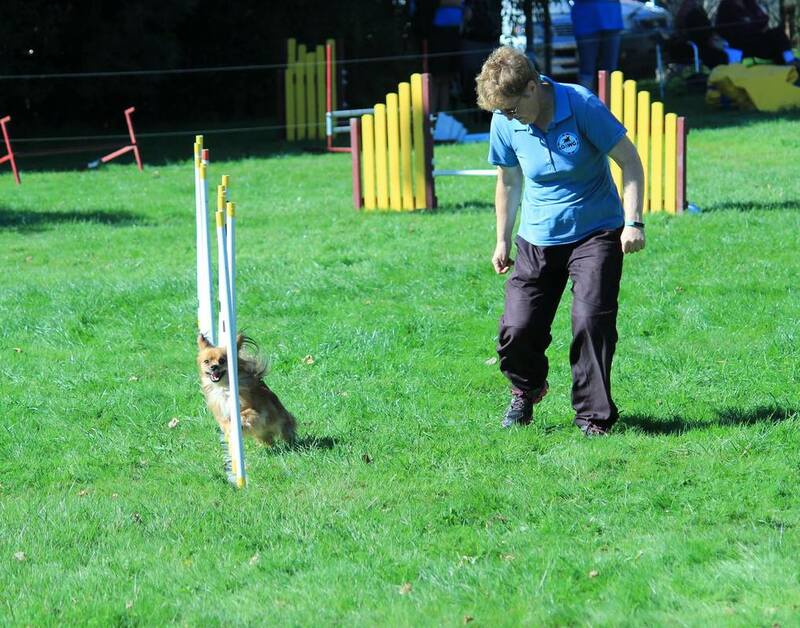 Just give it a go, once you and your dog can get around a simple course make sure you sign up for some ribbon trails, and of coourse keep up the practise at home - it makes a world of difference. Used to be called Loo! First dog Tor, a GSD x Great Dane, slow but a great first dog. 5 border collies and 2 papillons since then. 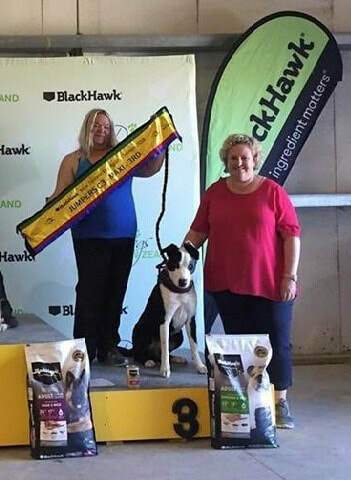 Bee (BC) was the second dog in NZ to get into Jumpers A, was one of a 3 team dog at NZDAC, and was an agility champion. Main dogs now are Gnat and Fluke, with Cricket waiting in the wings. Kaz my first BC getting his first clear round and a win by 12 seconds after competing for 4 ½ years. Fielding show where Kaz had 4 wins in the weekend. Bee (BC) getting Ag Ch. The camaraderie with club members and good friends at training and shows. First I saw a demo at a huge South Island breed show before I had dogs. Then I saw an agility demo at a country show in England years later when I had a dog. I put my name down and started a few months later. Used to do Fly but only agilty now. Don't take it too seriously but play to win. Be kind to your dog and to yourself. Dixie JD RN ZA HDN NTD CGCF –Yorkshire terrier the shortest dog to gain a jumpers dog title . Frank RN mini poodle. just starting out on his agility journey. The unique relationship you build with your dog and all the great friends who love nothing more than talking about dogs for hours. I was reading a book about Yorkshire terriers before I got my first dog (Dougal the yorkie). It mentioned agility can be a fun hobby. It didn't mention that did sport is addictive and all consuming. Since 2013. I have been training in agility since I was 11, so 5 years. 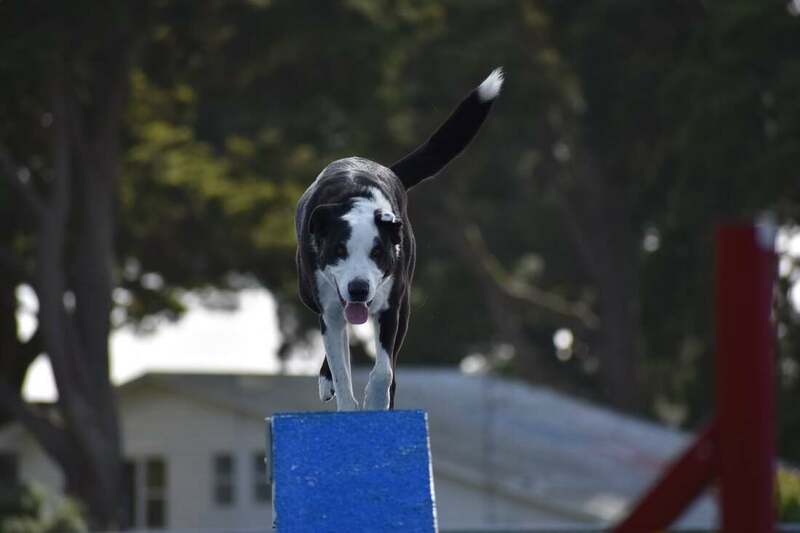 The first dog I trained in agility was Nugget who is a border collie x. After competing with him for a year I began training his littermate, Natcho who is still competing now. In 2016 I bought my own puppy, Cino, to train from scratch and it has been quite an adventure. 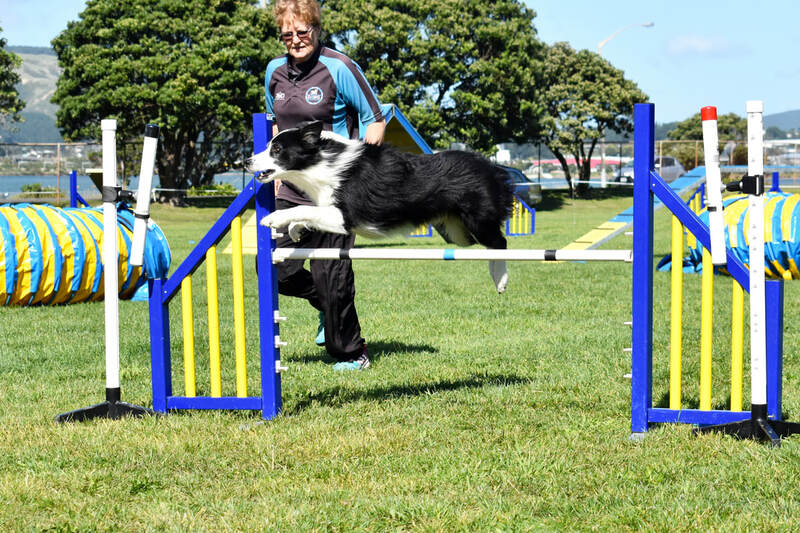 My best agility memory would have to be being a part of the winning zone team at NZDAC 2018 with Cino. I love seeing improvements in the dogs and handlers, also watching the top dogs at competitions doing their thing. I taught both Nugget and Natcho to jump over various things in the backyard before joining DAWG and never looking back. I have only properly trained and competed in agility but was tempted to do obedience with Cino as his dad really excels at it. Keep practising at home to get the best out of your dog and be prepared to get hooked! Someone at obedience mentioned it – I took Tip and after a year of agility she refused to do obedience as it was boring. Obedience, Show, Rally-o, Breed etc Idol and Toby do Rally-O. In the past I have done Flygility. Tip and Ben competed in Obedience. Your dog doesn't know if it went clear. Just let it have fun. • Chester – 5 years old, Farm rescue, Labrador x Collie. Chester was diagnosed with spondylosis before he could start competing in agility, so now he enjoys long walks and runs. We finished our first half marathon together earlier this year. • Ziggy – 18 months, SPCA heading dog. Adopted age 7 months. Ziggy is my ‘naughty but nice’ dog. Loves to work and is very quick to learn new tricks. Loves to bark, play games and annoy his two older brothers. Zig also snores, loudly. The challenge of working with your dog as a team, the supportive atmosphere - everyone offers advice to help you succeed, and when that training finally pays off and your dog actually listens to you…. Something I’ve wanted to do since I watched them at Crufts years ago… I just had to get a dog first. No, would love to do canicross though. Give it a go, don’t take it too seriously and have fun.